This historic photograph was taken by Fr. 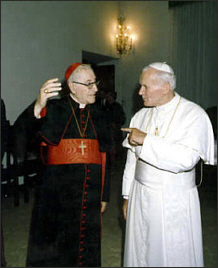 PKVT on June 15th, 1988 (see time stamp on lower right corner) at the Istituto Ravasco convent in Rome, documenting the third clandestine meeting Fr. PKVT (and his team) had with the suffering Pontiff, foretold by Our Lady at Fatima. Pope Gregory XVII formulated/implemented a detailed Continuance of Papacy Plan from 1988 to 1989, which included creating Bishops (with canonical mission jurisdiction) & Cardinals. "To protect the faithful against deception and to assure them of competent and worthy ministers, the Church has ever insisted, and still does insist, that those who are to minister unto the faithful in the name of Christ and of the Church, must first receive the approval and authorization necessary." "In virtue of Christ's commission the plenitude of ecclesiastical jurisdictional power lies in the hands of the Church. This power ... implies action and direction, be it legislative, judicial or coercive. It comprises the public power in virtue of which the Church is assigned the task of leading men back to God. With all this power at her command, the Church is left to her resources to marshal that power in whatever way may best serve her in attaining her one purpose on earth: the common salvation of mankind. Thus, speaking in the realm of possibility, one can readily admit that the Church could have granted vaster powers of jurisdiction to each and every priest, or she might have limited the number of acts demanding special power and authorization for their valid performance. climbs up another way, is a thief and a robber" (John 10:1.). "he who is elected is Pope ... no man can in any way call his election in question"
There is indisputable evidence that Gregory XVII fought the V2 sect's new religion - as his own priests in Genoa for years testified. He told his priests not to say the new mass. He said the decrees of the Second Vatican Council could "never bind". Logically the True Pope de jure, Gregory XVII, could only make such a statement [declaration] if the V2 Council documents LACKED papal jurisdiction (Church Authority) - which they incontrovertibly did. Some say "but he recognized the antipopes". Yet, Pope St. Martin I, who recognized Antipope Eugene I, did not cease being pope [forfeit his office] as he, like Gregory XVII, was put under grave duress, by the Church's enemies. 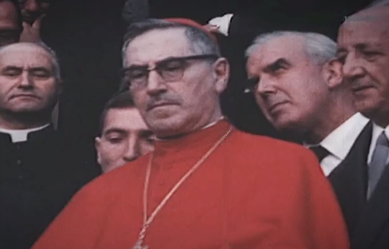 There are numerous quotes showing that Pius XII's hand-picked successor, Gregory XVII, despised Roncalli and all of the post-conciliar false claimants and their V-2 cult. Right reason alone, resolves these absolute contradictions, from this Genoan genius, who so loved Holy Mother Church. In a near miraculous type moment, out of view from the ever present and threatening masonic handlers, he was able to express the horrific fact that his jailors could, "kill", him "at any time!" St. Thomas Aquinas on whether violence (duress) causes involuntariness? "Cardinal Mindszenty Tortured For 29 Days And Nights"
"Hungary's Cardinal Mindszenty was tortured by Red secret police for 29 days and nights before his trial on treason charges in 1949 he disclosed in an interview published tonight. "Towards the end of the world, tyrants and hostile mobs will rob the Church and the clergy of all their possessions and will afflict and martyr them. Those who heap the most abuse upon them will be held in high esteem. At that time, the Pope with his cardinals will have to flee Rome in tragic circumstances to a place where they will be unknown. The Pope will die a cruel death in his exile. The sufferings of the Church will be much greater than at any previous time in her history. But God will raise a holy Pope, and the Angels will rejoice. Enlightened by God, this man will rebuild almost the whole world through his holiness. He will lead everyone to the true Faith. Everywhere, the fear of God, virtue, and good morals will prevail. He will lead all erring sheep back to the fold, and there shall be one faith, one law, one rule of life, and one baptism on earth. All men will love each other and do good, and all quarrels and wars will cease." *Post on how to have ipso facto penalties of censure (such as automatically incurred for participation in non-Catholic worship [N.O. sect & their sspx, sedevacantist] services) officially removed by the Holy See in exile -so one can share in the Church's treasure of heavenly graces. Thanks for all the information the editor and staff have put out. With out it we would have never known what happened to the church. Thanks to the editor for providing this documentation. Blessed be St. Peter, Prince of the Apostles! You can see in many pictures of Pope Siri, a real look of suffering and pain. No one can judge him. Definitely, one would be the eminent papal historian Alexis-François Artaud de Montor (d. 1849).